Woolly hats and gloves, mulled wine and mince pies, sparkling lights and tinsel – are we getting you in the Christmas spirit yet? Indulge in a bit of shopping, or just browse and take in the sights at one (or more!) 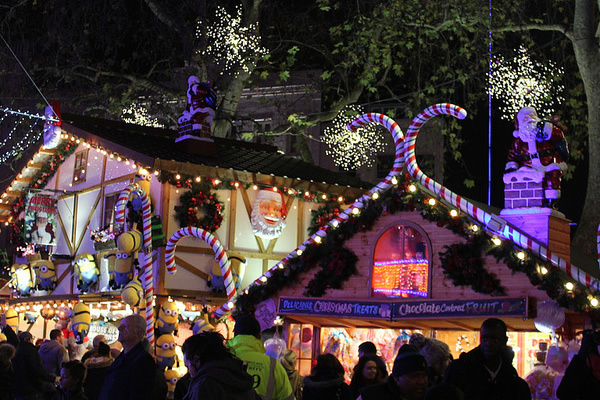 of London’s best Christmas markets and fairs this winter. 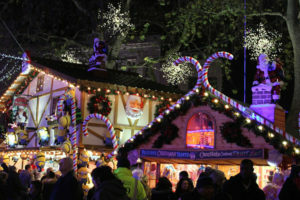 Originated in Germany, now a big part of the festive period throughout Europe, London is home to some of the best Christmas markets with Bavarian style stalls, offering food and drinks, sweet treats, a wide range of festive crafts you can buy as gifts (or just treat yourself) and even fun rides. You never know, you might meet Santa and Rudolph too! London has to be one of the best places in the world to celebrate Christmas, so we have also created a lovely yuletide blog detailing some of the amazing Christmas events in London this year: Check out our guide to Christmas events in London 2018 too. 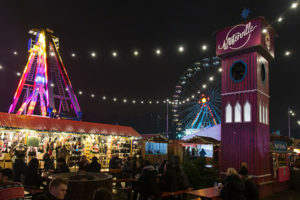 We feature Winter Wonderland in our Christmas events in London blog but we would find ourselves on the naughty list if we did not highlight the Christmas market at Winter Wonderland in Hyde Park. Here you’ll find over 200 fairy-lit Bavarian style wooden chalets offering up jewellery, accessories, crafts, clothing, traditional Christmas decorations and more. 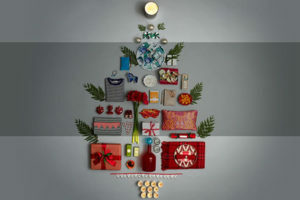 The atmosphere will have you buying your family, friends and even yourself lots of special treats for Christmas. The winter market at Southbank Centre offers up a seasonal mixture of food, drink and crafts from around the world. 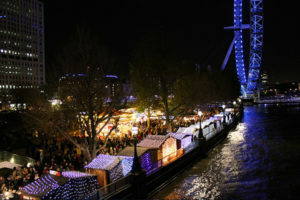 See the sparkling lights reflected in the River Thames and indulge yourself in classic sweet treats like pancakes and waffles or savoury winter favourites like smoked salmon, bratwurst and raclette. Southbank Centre, Belvedere Road, London SE1 8XX. Open from Friday 9 November until Thursday 27 December 2018. Sunday – Thursday 11am – 10pm and Friday – Saturday 11am – 11pm. Free entry. Around 25 stalls will set up around the famous Leicester Square, offering traditional Christmas fair. Festive decorations, handcrafted gifts sit alongside food and drink to keep you warm on the cold winter nights. After exploring the market, you can step inside the traditional 1920s Spiegel tent to enjoy a wide range of Christmas entertainment for all ages. Leicester Square, London WC2H 7NA. Open from Friday 9 November 2018 until Sunday 6 January 2019 between 12pm – 10pm Monday to Friday and 10am – 10pm on Saturdays and Sundays. Closed on Christmas Day and Boxing Day. Free entry. The Christmas market at Greenwich opens with a handmade lantern parade by local school children and the turning on of the Christmas lights on 21 November 2018 at 4pm. 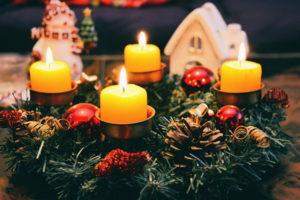 As you would expect the market will be offering beautiful seasonal gifts and enticing food and drink that are sure to get you into the Christmas spirit. Expect to meet Santa and his reindeers here during the festive time. 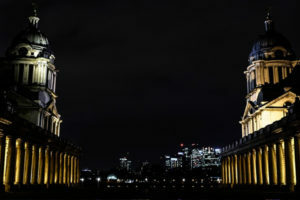 Old Royal Naval College, King William Walk, London SE10 9NN. Opening dates and times to be confirmed soon. Free entry. 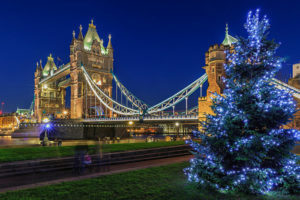 Over 60 independent traders make up this lovely Christmas market that part overlooks icons such as Tower Bridge and Tower of London. Here you’ll find artisan gifts, boutique accessories and fantastic food. They also run seasonal workshops in the chalet event space to help you prepare for Christmas physically, creatively and romantically. London Bridge City, 2A More London Riverside, London SE1 2DB. Open from Thursday 29 November 2018 until Wednesday 2 January 2019. Opening times to be confirmed soon. Free entry. Winterville in Clapham Common is another Christmas extravaganza we have more details for in our Christmas events in London 2018 post, but it would be remiss to leave it out of Christmas markets. Here you will find Street Feast which brings together some of London’s best food and traders, to offer such fare as juicy ribs, soft Chinese buns, wood-fired pizzas, hot toddies, mulled wine and even frozen toffee vodka shots. With plenty more to do in Winterville you can experience a full Christmas of alternative entertainment and food and drink. Clapham Common, Windmill Dr, London SW4 9DE. Open from Thursday 15 November until Sunday 23 December between 3-10pm in the week, 10am – 10pm at the weekends. Free entry for under 16s at all times. Adults go free on Tuesdays. £2 on Wednesday, Thursday and Sunday, £2 after 12pm and £5 after 6pm on Friday and Saturday. The Pear Tree Café in Battersea Park runs a Christmas market on two weekends in December. 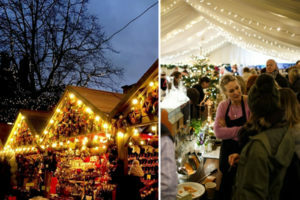 During these weekends the marquee is turned into a winter wonderland with a host of unique stalls, Christmas trees, carol singers, mulled wine & raclette. Enjoy the Christmas shopping overlooking the lake and then relax with a drink or some festive food. Lakeside Cafe, Battersea Park, London SW11 4NJ. Open on weekends of 01-02 and 08-09 December between 11am – 5pm on Saturdays and 10am – 5pm on Sundays. 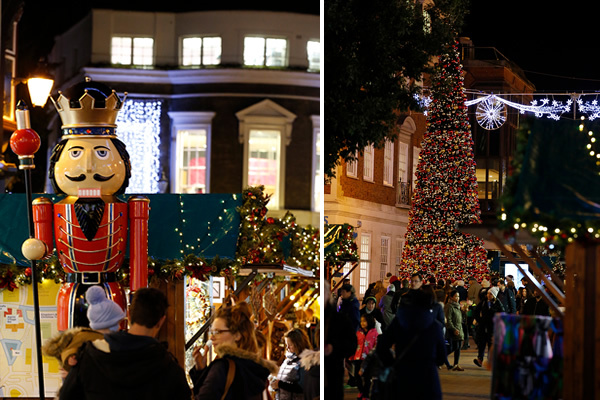 The whole town of Kingston transforms over Christmas as the market spreads throughout the Ancient Market Place and through surrounding pedestrian streets. Here you’ll find over 50 Christmas chalets selling arts, crafts and decorations alongside a large heated marquee. 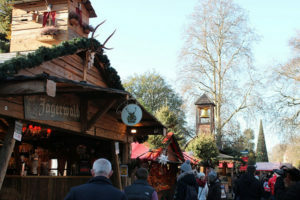 There are also two large outdoor bar areas serving up your favourite Christmas food and drink. Kingston-upon-Thames town centre, Greater London. Free entry. Open from Thursday 15 November until Monday 31 December. Opening times to be confirmed soon but we expect it will be closed on Christmas Day and Boxing Day. A botanical slant to this Christmas fair in London will bring you plenty of unique gifts to choose from and you can even learn how to wrap your chosen presents perfectly, with the in-house masterclasses. Warming herbal lattes will refresh you for the shopping ahead, but here it will be a less frantic experience. Young and old can go see Santa and sing the carols too. 66 Royal Hospital Road, Chelsea, London SW3 4HS. Open on Saturday 24 November 10am – 5pm and Sunday 25 November 10am – 4pm. Members and children go free. Adults £6. It might be pushing it a little bit to describe this as a market, but it does bring together a huge range of boutique traders under one roof, so we think it earns it’s place on the list. Styled as the home of Christmas shopping in London, you’ll find over 825 independent boutiques and designers giving you a massive choice to fill your stockings with. It’s also an indoor event so you won’t have to worry about the frostbite. If you want to get your Christmas shopping done all in one go, then you cannot go far wrong at the Spirit of Christmas Fair in Olympia. Olympia London, Hammersmith Road, London W14 8UX. Open from Monday 29 October until Sunday 4 November between 10am – 6pm. Extended hours between 9:30am – 6pm on opening day Monday 29 October. Late night on Thursday 1 November between 10am – 9pm. Tickets from £25 for adults and £16 for children between 13-16 years.